I am researching the family of David Bone Seaton b. 1905 Johannesburg, South Africa. d unknown Vancouver, BC Canada. Jane "Jeannie" Laught b. 1842 Dreghorn, Ayrshire, Scotland d. 1880 Ayrshire. burial at Mauchline Churchyard. Second Wife of William Richmond Seaton, Agnes McLeod "Daisy" (Bell)Seaton b. 1875 Tarbolton, Ayrshire. d. 1972, Vancouver, BC. Daughter of David Bell b. 1848 Westerkirk d. unknown, Ardrossan, Ayrshire. Occupation was Gardener. BELL: Suddenly, at 18 Winton Street, Ardrossan, on 16th April, DAVID BELL, Gardener, Castlehill Nursery, aged 77 years - Funeral on Monday, at 2 o'clock; the only intimation and invitation. The date of death in the newspaper is a bit fuzzy but I think it's the 16th, and of course, someone dying in 1925 aged 77 would have been born in 1848, which fits in with the information you already have. Hi Nancy.Is that your trees on Ancestry .Is it only the David Bell side that are in the Ardrossan area?See you also have Mary Scott Wilson 1890 Stevenston died in Ardrossan.Isabell Glen bell married Thomas Scott Guthrie. Elizabeth Bell married to William Hunter of Ardrossan. Jane Reid Bell, married John Nicol 1878 Ardrossan. This all helps those on forum that has /or my not have done their Family Tree. Free site where you will find Intimations ,ect. on local families. BELL: At 18 Winton Street, Ardrossan, on the 20th of June, Jane Reid, dearly beloved wife of David Bell, aged 69 years. PennyTray, you're such an awesome help! Thank you! Just in case it's of interest, Georgeardrossan previously posted the following item. I'm assuming the David Bell mentioned is the one in which you have an interest. The annual supper in connection with the Society took place in the Commercial Rooms on Tuesday evening (4 December 1900), Mr D B Haining presiding. There was a good turnout. Mr David Bell acted as croupier. An apology for absence was intimated from Commissioner Barrie. A well-purveyed supper was served by Mr Reid’s staff after which a lengthy toast list was honoured. After The Queen, The Navy, Army and Reserve Forces was proposed by the chairman in a few brief and appropriate remarks. This is the opening paragraph of a longer report. Georgeflemingard has also made a mention that there was a "Bell's Garden" down behind Winton Park. That was where the Castlehill Nursery was located. George will correct me if I'm wrong but he, I think, is a child of the 1940s, so clearly the piece of land cultivated by David Bell continued to be known by his surname long after his passing. What wonderful information Penny Tray. Do you think anyone would recognize the gardens? I have some photos that I at first thought might be Kilmenny, since both David Bell and his son David Reid Bell were Gardeners. One of the gardens they both worked at was Market Garden or Kilmeny Gardens. I'll post the photos here then explain who I do know in the photos. I believe the photos are from 1920 or possibly 1919 for the bottom photo. In the first link the two photos of very poor quality, the woman on the bench on the far right is Agnes McLeod (Bell) Seaton and her daughter just below her Jean Marguerite Seaton. 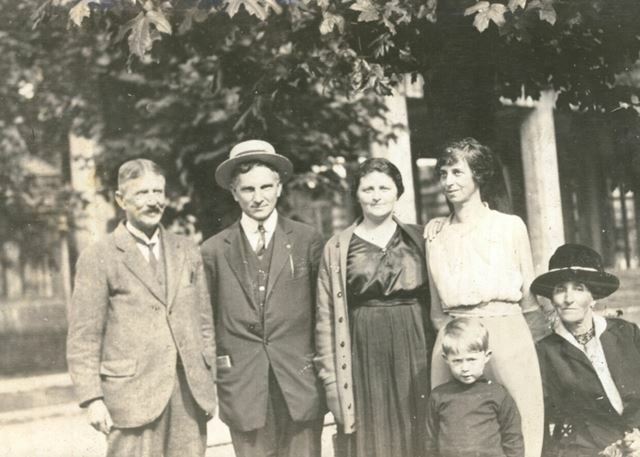 The photo directly below that in the same link on the far right is Agnes McLeod (Bell) Seaton, her husband William Richmond Seaton standing on the far right. The next next link or photo in much better condition is Agnes McLeod (Bell) Seaton in the middle wearing the sweater. The other people are unknown to me. Possibly Agnes's brother David Reid Bell who was also a gardener and his wife Mary Scott (Wilson) Bell. The older woman sitting down possibly the spouse of David Bell, (Jane (Reid) Bell, who we now know died in 1919. I did send these photos on to Hugh Gordon Seaton and he did no recognize any of these people being from the Seaton line so I am inclined to believe they are from the Bell side of the family. Thanks for your help Penny Tray! I'm trying to resize one photo that I removed from the above post, but it keeps getting cropped off. I'll try to resize it and repost it. It's the one of better quality. Last edited by Hughie on Fri May 30, 2014 11:38 pm, edited 1 time in total. Reason: Resized photo to 640 px wide. I think I'm getting the whole photo simply by clicking on it? Oh good, thanks Penny Tray! I am the middle daughter of David Bone Seaton b apr 10/1905 d May 22/1997, so I am able to add to your research as you have to mine. David came to vancouver ,bc canada at age 16 to live with his father,William Richard and step mother Agnes,they had a daughter Jean (if I ask around i may be able to give you more info on her.) On Aug 26/32, david married Ethel lilian Simpkins b Sept 09/1908 d Aug30/1993 They produced 3 daughters Elizabeth Ann born Sept 14/1936; Rhoda Jane (That's me) b.Nov 12/1943; Mary Lyell b Aug 09/1946 d Dec. 01/1993. Please note Ethel legally change her middle name to Lyell in the 70's or 80's. Elizabeth Ann married (Gerald Hughes deceased) and had a daughter Catherine Ann Jan. 27/1965. Rhoda married Daniel Charles Barrett Dec 23/1966. Daniel b Nov 03/1943. Rhoda had 2 children Jennifer Louise b Dec30/1969 and Christopher David b Mar 23/1973. Jennifer has a daughter Melissa Anne Rose Hunt (father Peter Hunt) and Christopher has 3 children Oksana, Charlie Jane, Kirk. (Mother Jennifer Evans) Hope this helps I am not on any ancestry web as yet. Forgot one thing my father had a cousin in south africa James Seaton Howie.